This finding fuels the debate about safety for unborn babies during maternal surgery, with researchers suggesting the estimated 75,000 women who undergo surgery while pregnant, be more closely examined for correct surgical timing. In a series of experiments detailed in the study, researchers demonstrated how exposing pregnant rats to anesthetics affects neuronal migration, the process in mammals in which neurons migrate from their original position deep inside the brain to their final position on the outer edge, or cerebral cortex. "The cerebral cortex, or grey matter, is the brain's computer processor. Cognitive processes like thinking, memory, and language are directed there, thus neurons never reaching their proper and predetermined positions in the cortex may have a profound impact on brain function." Vicko Gluncic MD PhD, lead author, Department of Anesthesiology, Rush University Medical Center, Chicago, IL, USA. To test that hypothesis, researchers marked migrating neurons in rat fetuses with a dye and then anesthetized one group of pregnant rats during the precise period when neuronal migration occurs is its most active. 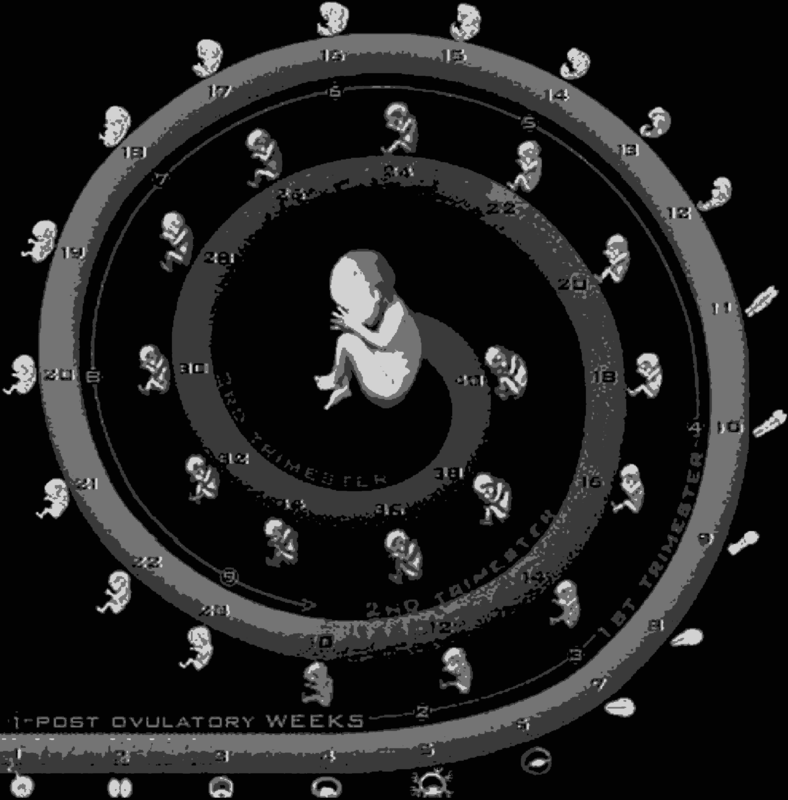 That gestation period roughly corresponds to the late second trimester in humans - when motoric areas of the brain are already well developed while somatosensory and visual cortex is still developing. A control group was not anesthetized. 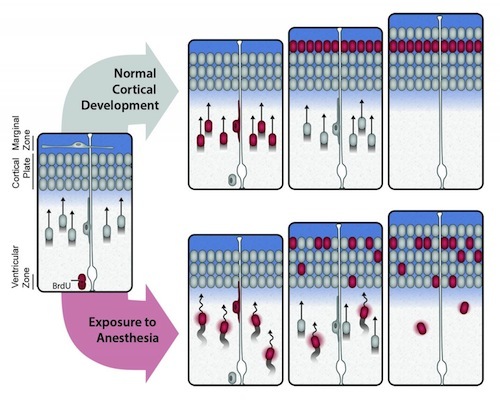 Rats exposed to anesthetics showed that significant number of neurons remained inappropriately scattered in deeper layers of cortex, and the longer the rats were exposed to prenatal anesthesia, the more scattered their neurons. A second set of behavioral experiments showed that all the littermates had consistent motor skills, but those exposed to anesthetics had significant behavioral and learnings deficits. "There is a clear association of anesthesia type and anesthetic duration with neuronal migration and cognitive deficits at the drug levels used here (in rat fetuses), what is needed now is to further validate the mechanisms involved as well as test various anesthetics and anesthetic protocols to evaluate differential impact on cognitive functioning." Mario Moric, Biostatistician, Rush Department of Anesthesiology, Rush University Medical Center, Chicago, Illinois, USA. "We don't want to push the panic button. It would be wrong if women delay or stop having medically indicated surgeries during pregnancy because of this. However, non-urgent surgeries in pregnancy are typically performed in the second trimester, after organogenesis, and when preterm contractions and spontaneous abortion are less likely than in last trimester." Dr. Gluncic continues: "Based upon the present data, the possibility that anesthesia may affect fetal brain development should be seriously considered and disclosed with informed consent for anesthesia in the second trimester — the most active period of human fetal brain development actually occurs between 12th and 24th week of pregnancy." During fetal development, cerebral cortical neurons are generated in the proliferative zone along the ventricles and then migrate to their final positions. To examine the impact of in utero exposure to anesthetics on neuronal migration, we injected pregnant rats with bromodeoxyuridine to label fetal neurons generated at embryonic Day (E) 17 and then randomized these rats to 9 different groups receiving 3 different means of anesthesia (oxygen/control, propofol, isoflurane) for 3 exposure durations (20, 50, 120 min). Histological analysis of brains from 54 pups revealed that significant number of neurons in anesthetized animals failed to acquire their correct cortical position and remained dispersed within inappropriate cortical layers and/or adjacent white matter. Behavioral testing of 86 littermates pointed to abnormalities that correspond to the aberrations in the brain areas that are specifically developing during the E17. In the second set of experiments, fetal brains exposed to isoflurane at E16 had diminished expression of the reelin and glutamic acid decarboxylase 67, proteins critical for neuronal migration. Together, these results call for cautious use of anesthetics during the neuronal migration period in pregnancy and more comprehensive investigation of neurodevelopmental consequences for the fetus and possible consequences later in life. V Gluncic, M Moric, Y Chu, V Hanko, J Li, I K Luki?, A Luki?, S L Edassery, J S Kroin, A L Persons, P Perry, L Kelly, T J Shiveley, K Nice, C T Napier, J H Kordower and K J Tumanh. 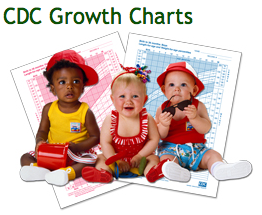 profound impact on brain development. CREDIT: Dr Vicko Gluncic MD PhD.